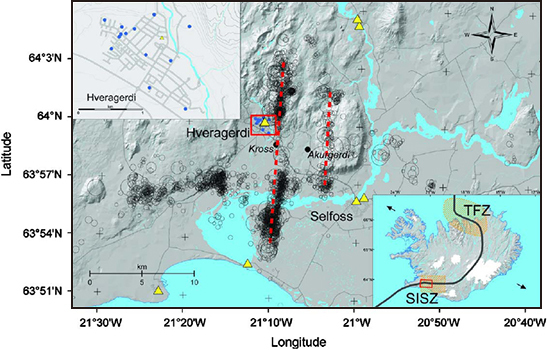 Using a unique dataset of over 1700 ML1-4.5 aftershocks of the Mw6.3 Ölfus earthquake in the South Iceland Seismic Zone on 29 May 2008, recorded at hypocentral distances between 3 to 18 km by the ICEARRAY accelerometric array of 11 stations (d=54 m, D=1900 m) we intend to apply a beamforming algorithm to produce clear waveforms that allow a detailed earthquake source analysis using a suite of theoretical crack rupture source models. Optionally, a relocation of the aftershocks based on the array data can be done to decide whether a specific array response calibration can yield higher array-derived direction of arrival accuracy. Additionally, the near-source array data may allow tracking of the mainshock’s rupture front propagation across its two faults, which can be a valuable addition to training datasets of array-based Earthquake Early Warning applications.